Still talking about that great Netflix rental you saw last night? Now you can continue the conversation on Facebook. Starting today, Netflix has integrated its movie rating service with Faceboook Connect. 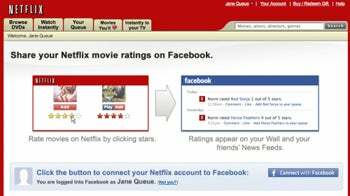 Movies you rate on Netflix will jump into your Facebook stream and profile page where your friends can also comment. This is an opt-in only service that you can start up at http://www.netflix.com/facebookconnect. Once your accounts are linked, you can decide to push all your movie ratings onto Facebook or share ratings on a case-by-case basis. Your rating will also link back to the Netflix page where friends can add or delete the movie on their own Netflix queue. Movies have always been a great conversation starter, and it seems Netflix members may be ready to get the discussion going. Netflix says it has more than 2 billion movie ratings from its 10 million members meaning the average Netflix user has rated about 200 movies. That's a lot of cinema to talk about, and I'm sure the odd "hot topic" movie will get some chatter on Facebook. For example, when The Watchmen comes to DVD I have no doubt that arguments will break out on Facebook between those who loved the movie and those who hated it. However, it seems to me that most movie ratings will just float down the Facebook stream unnoticed. Yeah, it's a nice feature I suppose, but if Netflix really wanted to wow us, how about streaming capabilities within Facebook for Netflix members? Now that would be something worth a five-star rating. Want to tell Netflix what you think of the new feature or what they should add in the future? Visit them on Facebook or on Twitter.